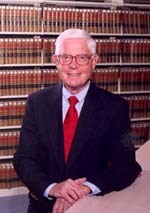 Former United States presidential candidate John B. Anderson, who received 6 million votes as an independent candidate in 1980, served as chair of FairVote from 1996 until 2008 after four years as chair of its Advisory Board. John’s recent media appearances include the BBC, NPR and C-SPAN among others. He is a frequent lecturer and expert commentator on issues of electoral reform, United Nations reform, foreign affairs, American politics, and independent candidacies. He also writes regularly on the role of Congress in both domestic and international affairs. For years he was president of the World Federalist Association. Mr. Anderson teaches constitutional law at Nova Southeastern University. He has taught political science as a visiting professor at numerous universities, including Bryn Mawr College, Brandeis University, Stanford University, Oregon State University, the University of Illinois and the Washington School of Law. Between 1961 and 1981, Mr. Anderson served ten terms in the U.S. House of Representatives from the 16th District of Illinois. He served on the House Rules Committee and for a decade was Chairman of the House Republican Conference. He served as States Attorney in Winnebago County, Illinois for four years. During World War II, Mr. Anderson was a staff sergeant in the U.S. Field Artillery. In foreign service between 1952 and 1955, he was Economic Reporting Officer in the Eastern Affairs Division. Mr. Anderson earned his B.A. and J.D. from the University of Illinois, Urbana-Champaign, received an LL.M. degree from Harvard Law School in 1949, and has since been awarded honorary doctorates of law from Wheaton College and Trinity College.